Pros: super sharp, super lightweight, strong - there's no bending of these metal needles at a size 1, unlike other needles I own. I am a tight knitter Cons: not slidey enough! When I knit, I like to go fast, so I prefer needles that the yarn practically falls off of. 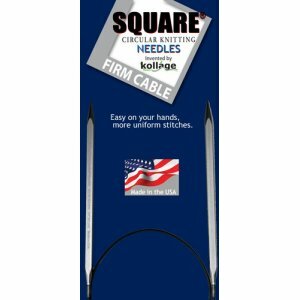 If you prefer a little stickiness to your needles, these may be perfect for you. The criteria I use for a perfect needle is: 1 sharp points 2 aluminum barrel because yarn 'grabs' the yarn without the yarn slipping or sliding, and 3 cable that is firm enough that it doesn't twist or kink that is, if you're using circulars. Providing your knitting tension is consistent I.e., not too tight or too loose the stitches come are perfect. Knit a gauge first to ensure you'll be spot-on with the gauge needed. I really do like this style of circular needles but the cable came off of one of the tips. I was in the middle of a row for a shawl Im making for a Christmas gift. I like that I could buy circular needles 40 inches long so I ordered another one. I got these for the unusual shape... thinking i wouldn't like them as much as i do. I have a tendency to knit tight and these needles prevent that from happening. They are great for loose work. I love the size 9s I chose, although I bought as circulars, which are useful to me but I really look forward to when I purchase the same size as dpns... I get excited finding projects exclusively for these needles. Love love love them. Love these!!! Nice and pointy for lace and they really make stitches like k3togs, or SSKs so much easier! Never have had an issue with these, whatsoever! I bought a few of these needles to try out on a shawl. They are very light and comfortable, but I did run into a problem. The shawl I was knitting required two different needle sizes. I knit happily with the first needle, then switched to the the larger one. I only knit for about 1 1/2 rows, and the needle broke at the join! I was able to save my stitches with a different needle and finish the shawl, but it was very scary there for a while. While I love how these needles feel, I am not sure I could ever recommend them after what happened to me. Hopefully I just had a defective needle. A few of the knitters in my weekly group think square needles are strange, but with a wee bit of arthritis in my fingers,I find these needles very comfortable. I love the double points for socks.